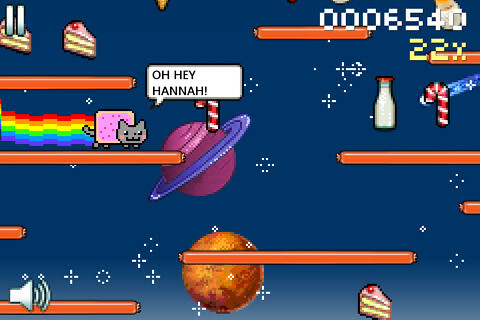 If the cat who farts rainbow hasn’t annoy you enough yet, why not play a game about the Nyan Cat getting lost in space? 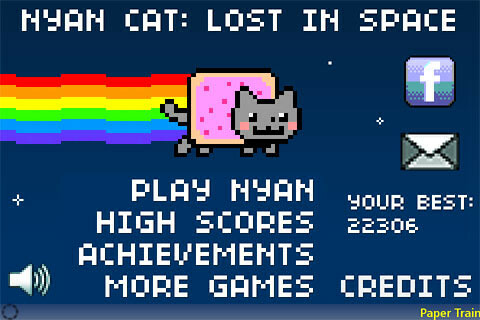 Produced by IsTom Games, Nyan Cat: Lost In Space sets you controlling Nyan Cat or its black evil counterpart around the space with lots of platforms and sweet desserts. What a coincidence huh? The gameplay is simple. Tap once to jump, tap twice to double jump. Lol. 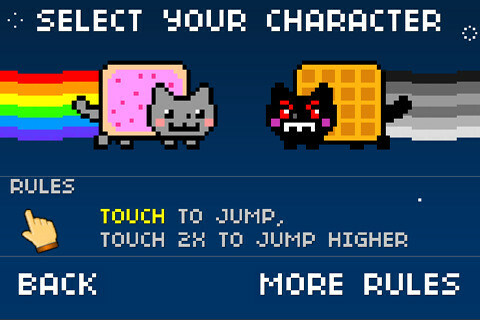 Nyan Cat moves from left to right while the black evil counterpart moves the opposite direction. Also try to spot a Scooby Doo like dog that chases Nyan Cat around the game. Scooby Doo got lost in space too? Just like the website, you can brag with your friends when you achieve a new high score. Post them on Facebook and challenge your friends to NYAN NYAN NYAN NYAN NYAN NYAN NYAN in space too. I suggest you don’t watch the whole video cos the music is actually quite annoying. LOLOL. Well you know what I mean. One Response to "Nyan Cat: Lost In Space for iPhone, iPod Touch & iPad"